Gaughan: Will Warriors Beat Cavs Again? The NBA Finals begin on Thursday. 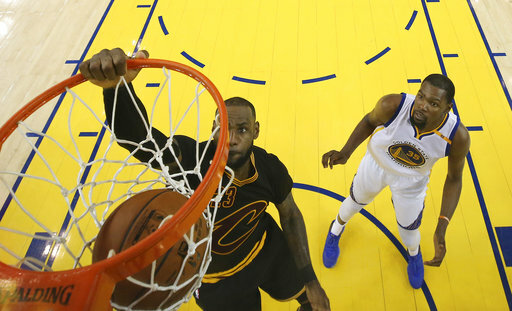 For fourth straight year, it will feature the Cleveland Cavaliers against the Golden State Warriors. Buffalo Sports Page’s Bob Gaughan breaks down both teams. It starts and ends with Lebron James. I would argue this is Lebron’s most impressive post-season since entering the NBA. He has played every game and needed to play every minute of every crucial moment in the post-season. He simply can’t have an off night or the team is sunk. It’s hard to beat Lebron four times as the Celtics found out. Those that still think that Michael Jordan is the GOAT are becoming fewer and fewer as his career goes on. The health of Kevin Love will be crucial. Love missed game 7 in Boston. He’s the Cavs second best player and needs to provide some help for this series. Jeff Green needs to play more. Not sure why Ty Lue, who’s been looking for a better complement of players, has had Green on the bench for the majority of these playoffs. Green to me is more reliable than anyone else Cleveland has on the roster with the exception of Love. How much will the Cavs get from George Hill, JR Smith and Kyle Korver? These players seem to play better at home but they need one or more to step on the road as well. Never thought I’d say this but the Warriors are lucky to be here. The Rockets, if Chris Paul was healthy, should have won. No way the Rockets blow those big leads in game six and seven if Paul is healthy. No way the Rockets miss 27 straight three pointers if Paul is healthy. But in the end the Warriors move on. Steph Curry found his mojo late in the series. He is such an instant offense player. In Game 7 in the third quarter he alone brought them from 3 down to up 7 in a mere seconds. Most on bad shots for every other person on this earth other than him. The supporting cast for the Warriors is so much better. Kevin Durant, Klay Thompson and Draymond Green should all have an easier time than they did against the Rockets. The Warriors come in being able to sleep walk through first halves and then flip a switch in the third quarter. That’s always dangerous for a team. Steve Kerr gets the edge coaching for me over Ty Lue. Fourth straight year we get this match-up in the NBA finals. This will be the last year they meet up. Have to believe Boston and Houston both are the better teams next year. The Warriors defeated a far superior Cavs team with Kyrie Irving last year in the finals in five games. This is the Warriors series to lose. Lebron is the best player on the court but he has little around him this year. I’ll give the Cavs one win at home but like last year I’ll take the Warriors in five.